Winter is well and truly here! Make sure your aches and pains are dealt with quickly before they become chronic and more difficult to settle down. Did you know that we have four conveniently located clinics in Perth? We also offer free onsite parking for our clients at all of our offices, except for the Hay St Mall CBD rooms. Click on the link at the bottom of the page to see videos we post regularly on our website to help improve your fitness and health through our expert advice. Steve Jeffries has previously worked as a personal trainer and boxing coach, and is the head physio for Fremantle United Soccer Club. He works at our CBD, West Perth and Mosman Park clinics, and has a special interest in returning patients to full health through rehabilitation following injury. Merv Travers has submitted his PhD and joins us after two years as physiotherapist for the Western Force Super Rugby Club. He has post-graduate training in musculoskeletal physiotherapy and strength and conditioning, and has a particular interest in treatment of tendon injuries and chronic conditions. He currently looks after University Rugby Club. Be sure to keep an eye out for them at your next visit to Star Physio. 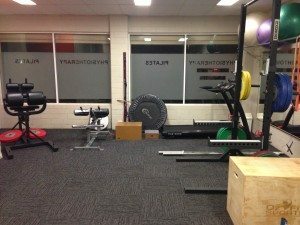 We are excited to announce the opening of our new conditioning facility at Mosman Park. Headed by Merv Travers, we have installed high quality and specific equipment aimed at high level rehabilitation and performance training, with a particular focus on the lower limb and tendon injuries. We offer one on one rehabilitation and in the future aim to run small group classes including specific strength for cycling classes. Tara West and Lara Mitchinson have recently completed further advanced training in Pilates. We have now added small group mat classes to our popular individual Pilates sessions. Currently, Tara is running these on Mondays and Wednesdays at South Perth, and we are about to begin them at Mosman Park and West Perth. Lara Mitchinson continues her role with West Coast Eagles and is also now head physio for Trinity Aquinas Football club. Tara West is currently in Canberra as head physio with the WA Junior Volleyball Teams before she jets off to Europe with the National Women’s team. Alex Chia is currently completing Master’s studies in Sports Physiotherapy part time while continuing his role with Star Physio. Mike Oostryck maintains his role as head physio for the WA and Australian Softball Teams, and heads off to Europe for World Championships later this year. Damian Oldmeadow extends his roles with Australian Volleyball and British Cycling and has recently returned from work at the AIS. His professional BikeFit service continues to be very popular. And don’t forget to check out our new website and Facebook page!